Last week global warming’s wrath swept through the United States and hardly anybody took notice. 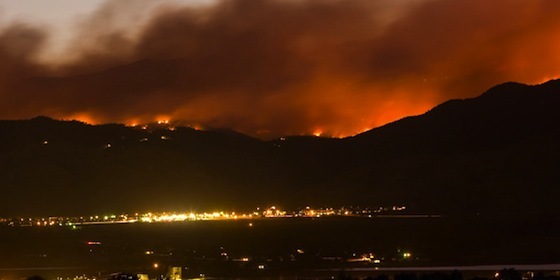 The worst wildfires in Colorado and Utah history torched hundreds of homes and miles of forest. The Waldo Canyon fire alone, which is still only 45% contained, burned 350 houses right down to the ground. Some residents returned yesterday to find their cars turned to scraps. Then the searing heat wave that exacerbated these fires marched on, joining forces with a furious hurricane-force wind storm that ripped through several states on the east coast. More than 3 million people are without power amid temperatures of 100 degrees Fahrenheit plus and could remain that way for a week or more. At least 17 people have died. Yet the world has been mostly silent; oil drillers drill on; new deals are signed. These fires, these storms, these are our future, and their fury will only grow. New records are being set every year. It’s only June, as environmentalist and 350.org founder Bill McKibben pointed out in a recent Guardian article, and already there have been four named tropical storms in the United States. Normally this doesn’t happen until August. In addition to being extraordinarily uncomfortable and even deadly, these disasters are costly. Colorado has spent $8.8 million on fighting the Waldo Canyon Fire alone. Add that to the costs of fighting fires in Utah, Wyoming, Idaho, Montana as well, along with repairs of downed power lines in the east, new cars and houses, and nationwide clean up. Cleaning up after ourselves: that is what we and future generations are going to be doing from now on. Cleaning up the mess our greed has made since the onset of the industrial revolution. We are going to pay the price of all those power plants and all those carbon emissions and it will become increasingly difficult to focus on anything else. Though we may not have hurricanes in our part of the world, our wildfires will grow more intense as well. And we know – all too well – about high temperatures and drought. But lacking the west’s sophisticated information infrastructure, we are less-well equipped to track the changes, which means it is harder to put escalating disasters into perspective. Saudi Arabia has warned residents to brace themselves for extreme heat this Ramadan, which will start around the 20 July this year. “Temperatures this summer will be higher than average in most parts of the country. It will reach 50 degrees Celsius in the shade,” said Murad Hashim, assistant undersecretary for climatic affairs and applied studies at the Regional Center for Drought Monitoring and Early Warning. The highest temperature recorded at Mecca since 1980 was was 49.7 degrees Celsius on Aug. 7, 2010. In 2010, severe drought in Russia brought Egypt to its knees. Why so? Because Egypt is the world’s largest importer of wheat and Russia is a major supplier. So is the United States, but forecasters are expecting a 50% reduction in grain stockpiles as a result of extended drought and heat and prices have already risen. Egypt will not get through this unscathed. Fires in southern Lebanon destroyed 46.7 acres of grassland and fruit trees last week. Following the winter freeze that destroyed 75% of bee populations in some areas of the country earlier this year, the country’s agricultural industry is at serious risk. High temperatures and virtually no rainfall is a deadly combination. Add an influx of refugees fleeing from Assad’s reign of terror in Syria and Jordan is battling to keep pace with demand. Tens of thousands of Syrians are seeking refuge in Jordan, which is one of the top ten driest countries in the world. “The majority of Syrian refugees are concentrated in the northern cities of Mafraq, Irbid, Ramtha, Jerash and Ajlun. All of these areas already suffer from water shortage,” Fayez Bataineh, secretary general of the Water Authority, told AFP. As temperatures rise and with it power outages (some parts of Lebanon are without power 12 hours a day), the use of diesel generators will climb as well. Each gallon of diesel fuel produces, on average, about 22.2 lb of carbon emissions, further fueling the source of our climate change woes. Avoid driving as much as possible. Use public transportation if you can and install a solar system at your home if you have the financial resources to do so. These problems will intensify, so the better prepared you are the better. Just think: the Lebanese goat farmer who installed a photovoltaic system at his house is able to stay cool and continue with business as normal while many of his peers are sweltering in the proverbial dark. Obviously, the accumulating local green initiatives are not enough to stop global warming, so there needs to be a movement to legally require all corporations, communities and government agencies to safely recycle 100% of all human-generated waste materials and peacefully reduce the human population with family planning education. Then the biosphere will return to its natural balance. Thank you for your comments. Although I think we (Green Prophet) usually try to look at the bright side of life and hate to beat our readers over the head with doom, occasionally I think it’s necessary for us to face the hard facts on everyone else’s behalf. It’s not easy. In fact, it can be downright scary. But the force of a thing is so much smaller once we face it head on. Thank you, Ms Laylin for your thoughtful article and you are correct Climate Change has been off the headlines of the media and politicians avoid it as much as they can (especially President Obama here in the USA). Actually, the scary part is we are pushing for a new glut of hydrocarbons in the world. CEO of Exxon-Mobile aims to develop unconventional tar sands and other fossil fuels. The sad part is he admits burning these will have an impact on the climate and we need to “adapt” and take engineering solutions. In his talk he mentioned moving agriculture regions and rising sea levels. He does not accept the forescasts of climate scientists and called them not reliable. So, that is the plan, unless there is a cost for carbon emissions the CO2 levels will continue to rise, even with our individual actions of cutting down. Brace yourself it will get worse. No one but the most “awake” green enthusiasts are going to stop driving. Heck, let’s just try convincing them to move down to one car, or to consider buying a hybrid or electric?